Story copyright © 1997, 1999 Aaron Shepard. Script copyright © 1999, 2002 Aaron Shepard. Scripts in this series are free and may be copied, shared, and performed for any noncommercial purpose, except they may not be posted online without permission. PREVIEW: When a young man’s wife makes him pose as a fortuneteller, his success is unpredictable. AHMED: (cheerfully) If you can dig a hole, you can always earn enough to stay alive. NARRATOR 4: That was enough for Ahmed. But it was not enough for Jamell. WOMAN: You can’t come in now. The wife of the King’s Royal Diviner is taking the whole place for herself. JAMELL: (angrily) Who does she think she is? Just because her husband tells fortunes! NARRATOR 3: But all she could do was return home, fuming all the way. JAMELL: Look at these few measly coins! I won’t put up with this any longer. Tomorrow you’ll sit in the marketplace and be a diviner! AHMED: Jamell, are you insane? What do I know about fortunetelling? JAMELL: You don’t need to know a thing. When anyone brings you a question, you just throw the dice and mumble something that sounds wise. It’s either that, or I go home to the house of my father! NARRATOR 4: So the next day, Ahmed sold his shovel and his pick and bought the dice and the board and the robe of a fortuneteller. Then he sat in the marketplace near the public bath. NARRATOR 2: Hardly had he gotten settled when there ran up to him the wife of one of the King’s ministers. MINISTER’S WIFE: Diviner, you must help me! I wore my most precious ring to the bath today, and now it’s missing. Please, tell me where it is! NARRATOR 3: Ahmed gulped and cast the dice. As he desperately searched for something wise to say, he happened to glance up at the lady’s cloak. There he spied a small hole, and showing through the hole, a bit of her naked arm. AHMED: Madam, I see a hole. MINISTER’S WIFE: (leaning closer) A what? AHMED: A hole! A hole! MINISTER’S WIFE: (perking up) Of course! A hole! NARRATOR 4: She rushed back to the bath and found the hole in the wall where she had hidden her ring for safekeeping and forgotten it. Then she came back out to Ahmed. MINISTER’S WIFE: God be praised! You knew right where it was! NARRATOR 2: And to Ahmed’s amazement, she gave him a gold coin. JAMELL: You see? There’s nothing to it! AHMED: God was merciful on this day, but I dare not test Him on another! JAMELL: Nonsense. If you want to keep your wife, you’ll be back in the marketplace tomorrow. NARRATOR 1: Now, it happened that on that very night, at the palace of the King, the royal treasury was robbed. NARRATOR 4: Forty pairs of hands carried away forty chests of gold and jewels. KING: Bring me my Royal Diviner and all his assistants. NARRATOR 3: But though the fortunetellers cast their dice and mumbled quite wisely, not one could locate the thieves or the treasure. KING: Frauds! Throw them all in prison! NARRATOR 1: Now, the King had heard about the fortuneteller who had found the ring of his minister’s wife. So he sent two guards to the marketplace to bring Ahmed, who appeared trembling before him. KING: Diviner, my treasury has been robbed of forty chests. What can you tell me about the thieves? NARRATOR 4: Ahmed thought quickly about forty chests being carried away. AHMED: Your Majesty, I can tell you there were . 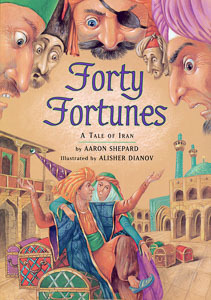 . . forty thieves. KING: Amazing! None of my own diviners knew as much! But now you must find the thieves and the treasure. NARRATOR 2: Ahmed felt faint. AHMED: I’ll . . . do my best, Your Majesty, but . . . but it will take some time. NARRATOR 3: Ahmed guessed the longest he could get. AHMED: Uh . . . forty days, Your Majesty. One day for each thief. KING: A long time indeed! Very well, you shall have it. If you succeed, I’ll make you rich. If you don’t, you’ll rot with the others in prison! AHMED: You see the trouble you have caused us? In forty days, the King will lock me away. JAMELL: Nonsense. Just find the chests like you found the ring. AHMED: I tell you, Jamell, I found nothing! That was only by the grace of God. But this time there’s no hope. NARRATOR 4: Ahmed took some dried dates, counted out forty, and placed them in a jar. AHMED: I will eat one of these dates each evening. That will tell me when my forty days are done. NARRATOR 2: Now, it happened that one of the King’s own servants was one of the forty thieves, and he had heard the King speak with Ahmed. That same evening, he hurried to the thieves’ meeting place and reported to their chief. SERVANT: There is a diviner who says he will find the treasure and the thieves in forty days! CHIEF: He’s bluffing. But we can’t afford to take chances. Go to his house and find out what you can. NARRATOR 3: So the servant climbed up to the terrace on the flat roof of Ahmed’s house, and he listened down the stairs that led inside. CHIEF: You must have imagined it. Tomorrow night, two of you will go. CHIEF: This time, I’ll go with you myself. NARRATOR 4: So all forty thieves climbed up to Ahmed’s roof to listen. NARRATOR 2: Inside, Ahmed gazed at the last date in the jar, then sadly took it out and ate it. AHMED: That’s forty. The number is complete. NARRATOR 3: Jamell sat beside him. JAMELL: (gently) Ahmed, during these forty days, I’ve been thinking. I was wrong to make you be a diviner. You are what you are, and I should not have tried to make you something else. Can you forgive me? AHMED: I forgive you, Jamell, but the fault is mine as well. I should not have done what I knew was not wise. But none of this helps us now. NARRATOR 1: Just then came a loud banging at the door. AHMED: (sighs) The King’s men already! AHMED: All right, all right, I know why you’re here. NARRATOR 2: He swung the door open. To his astonishment, he saw forty men kneeling before him and touching their heads to the ground again and again. CHIEF: Of course you know, O great diviner! Nothing can be hidden from you. But we beg you not to give us away! AHMED: Very well, I won’t turn you in. But you must replace every bit of the treasure. CHIEF: At once! At once! NARRATOR 1: And before the night was through, forty pairs of hands carried forty chests of gold and jewels back into the King’s treasury. NARRATOR 4: Early the next morning, Ahmed appeared before the King. AHMED: Your Majesty, my magic arts can find either the treasure or the thieves, but not both. Which do you choose? KING: The treasure, I suppose—though it’s a pity not to get the thieves. The boiling oil is all ready for them. Well, never mind. Tell me where the treasure is, and I’ll send my men right away. AHMED: No need, Your Majesty. AHMED: Pish posh, wish wosh, mish mosh. By my magic, the chests have returned to their place. NARRATOR 3: The King himself went with Ahmed to the treasury and found it so. KING: You are truly the greatest fortuneteller of the age! From this day forth, you shall be my Royal Diviner! AHMED: (bowing) Thank you, Your Majesty, but I’m afraid that’s impossible. Finding and restoring your treasure was so difficult, it used up all my powers. I shall never be a diviner again. KING: What a loss! Then I must doubly reward you. Here, take two of these chests for your own. NARRATOR 3: and a good deal wiser. ALL: they lived happily ever after.